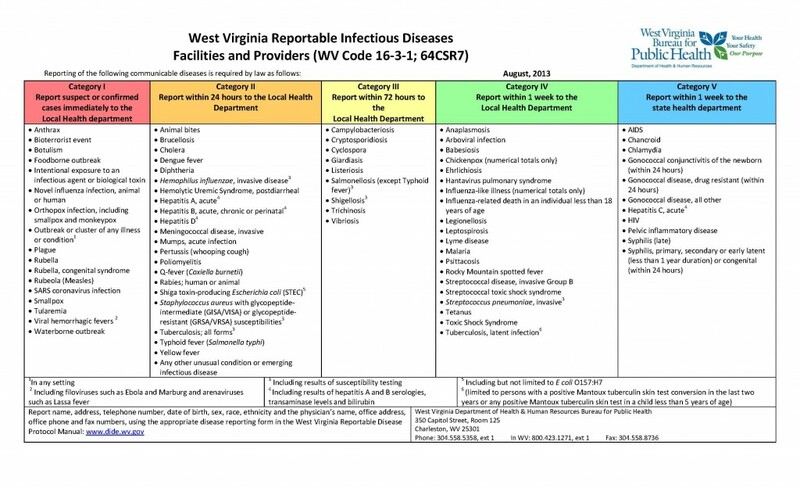 All healthcare providers and laboratories should be familiar with diseases that are reported to the local health department by WV code. Reports can be made using the reportable disease report card, linked below. These reports are received by the regional epidemiologist, who then follows up with each case to attempt to ensure that the public is safe from this disease. Changes to the list of reportable diseases were made in August 2013, and can be reviewed on the “Reportable disease wall chart” below (click the picture to enlarge). The MOVHD also issues health alerts and warnings to healthcare providers and laboratories from the WV DHHR and CDC. If you do not believe your facility is receiving these alerts, please contact the MOVHD and be prepared to provide your fax number. Members of the epidemiology team are available for presentations, in-services, workshops, and training on issues related to infection control, infectious disease surveillance data, vaccinations, and a number of other issues. If you are interested in requesting training, please contact MOVHD via phone or email.